In a recent project we developed Web Services that expose geographical data in their operations. This blog explains the use case for the service, gives an overview of the software architecture, and briefly discusses GML as markup language for geographical data. Part 2 of this blog provides pointers on the implementation of the service while part 3 discusses the deployment on Oracle WebLogic Server. The "BAG" (Basisregistratie Adressen en Gebouwen) is a Dutch national database containing information on all addresses and buildings in the Netherlands, and is maintained by Dutch municipalities. For several object types the BAG also maintains the associated geographical location and shape; for example for premises and cities. Often organizations have their own GIS/GEO systems and databases for analysis and decision-making purposes. In this particular project we created Web Services to retrieve and modify the geographical data in these GIS/GEO systems based on updates from the national BAG database. There are of course numerous use cases for geo-based services such as creating mashups with maps and viewers, and offering geo-based public APIs for your customers to integrate with. The following figure shows an overview of the software architecture for the Web Services we developed. Database schema containing the geographical, and related administrative data. 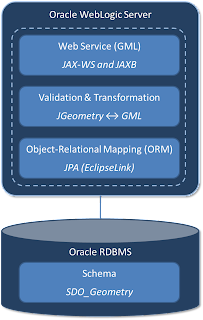 The schema is located in an Oracle RDBMS 11g Enterprise Edition instance. The geometry is stored as SDO_GEOMETRY type; an Oracle spatial object type that provides methods for storing, accessing, and altering geographical attributes. 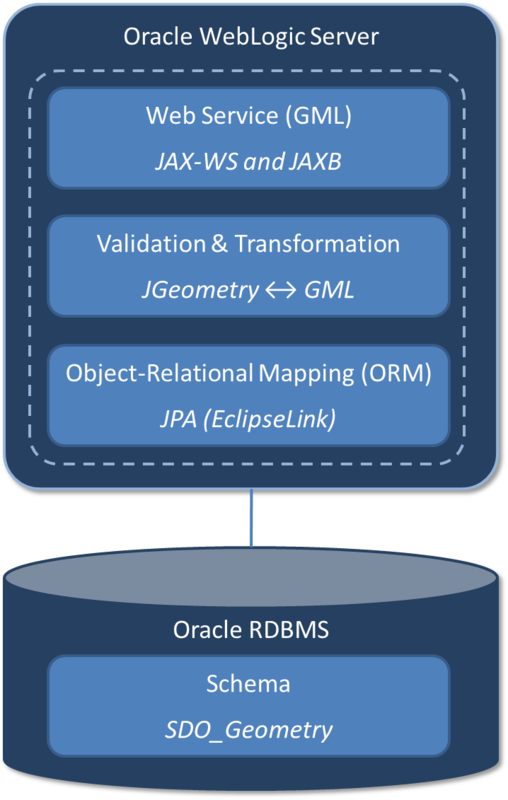 Object-Relational Mapping (ORM) layer that provides access to the geographical data by converting SDO_GEOMETRY database object types into JGeometry Java objects. The persistency layer is implemented using the JPA (Java Persistence API) standard and EclipseLink as persistency provider. JGeometry is a Java class provided by Oracle as part of the Oracle Spatial Java functionality. Web Service layer that exposes the service and its operations to consumers using SOAP. The operations expose geographical elements as GML (Geography Markup Language) data types. GML is an XML grammar for expressing geographical features that is maintained by the Open Geospatial Consortium (OGC). The Web Service layer is implemented using JAX-WS and JAXB. Business logic layer that contains Java logic for validation and transformation. As part of the transformation logic, this component converts GML elements into JGeometry objects and vice versa. The following XML snippet shows an example of a GML element. Such elements are part of the input and output of the Web Service operations. In this case, the element denotes a single polygon containing a hole. The polygon is defined by the exterior element, and the hole is defined by the interior element. There are several versions of GML available. The accompanying XML Schemas for GML can be found on the OGC website. GML doesn't define a default Coordinate Reference System (CRS) from which the absolute position of the defined GML elements can be determined. Instead you have to define what coordinate reference system should be used. This is done by specifying the srsName attribute. In the above example, the EPSG::28992 (European Petroleum Survey Group) reference system is used which has the Dutch city of Amersfoort as reference for GML elements. You can find several reference systems at http://spatialreference.org and http://www.epsg-registry.org. You need to define the dimension of the GML elements using the srsDimension attribute. In the above example all elements are two-dimensional. GML defines several geographical types. In our use case, a residence or municipality is represented by a point, simple polygon, or multi surface. A multi surface can include multiple polygons, for example when defining two buildings that are not attached but together form one residence. The available geographical types for GML can be found on the OGC website as well. Part 2 of this blog will dive into some interesting implementation aspects of the Web Service.